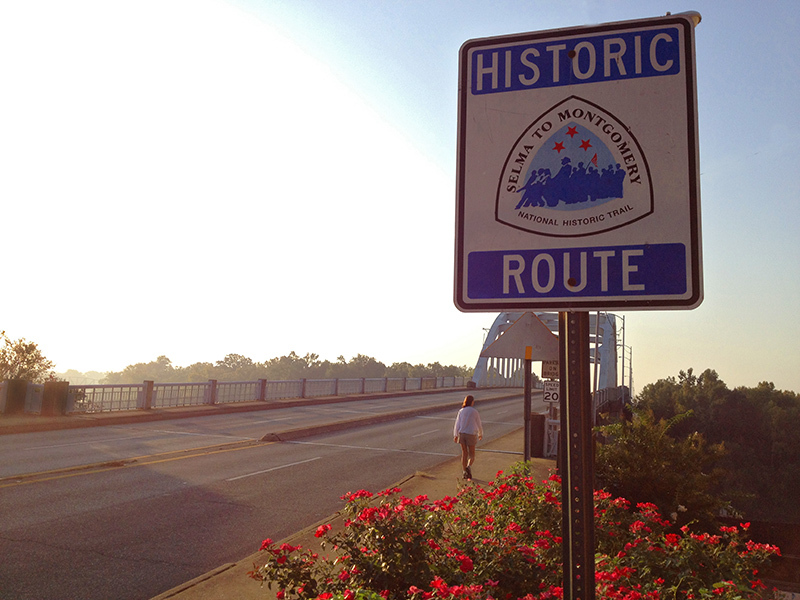 Walking along the Selma To Montgomery National Historic Trail in Selma, Alabama. Martin Luther King, Jr. traveled to Selma, Alabama in March 1965 to bring national attention to a local voting rights initiative for African-Americans. By the mid-1960s, the American civil rights movement had become very active in this part of the South. Although President Johnson had recently signed the Civil Rights Act of 1964, efforts to enact that law were failing in places like Alabama. For example, blacks who attempted to enter restaurants or theatres were beaten or arrested during this time period. The situation was developing into a crisis after the Student Nonviolent Coordinating Committee had encountered violent resistance from white citizens’ groups like the Ku Klux Klan and local police. Martin Luther King, Jr. and other leaders of the civil rights movement planned a march from Selma to the State Capitol, believing it would be a good way to bring national attention to their plight. The first march from Selma to Montgomery occured on March 7, 1965 and ended in violence when 600 marchers were halted after crossing the Edmund Pettus Bridge in Selma. State and local police had attacked the protesters with billy clubs and tear gas. After numerous delays, a final effort was made to complete the march, this time under the protection of 4,000 Army soldiers and the National Guard. The marchers’ arrival in Montgomery on March 24 came under the protection of these federal troops and today’s Selma To Montgomery National Historic Trail commemorates these events.